Scratch off tickets are an intriguing way to engage your customers. Response rates from games such as scratch offs are impressive. This is due to the fact that the receiver of a ticket takes possession of a potentially valuable prize. As one of the most effective forms of promotion, scratch offs are an experience where everyone wins. Reward your clientele with scratch off cards which uncover news about your business, including new items, deals and giveaways. Incorporating discounts and coupons can capture new customers while rewarding your loyal following. Fast food restaurant chains such as McDonalds have utilized this technique for decades to huge success by requiring the player keep collecting the losing items for an even larger prize. For promotional events such as expos or trade shows, distributing scratch off cards with coupons to participants will make your organization stand out and will likely reel in new business. Contrary to popular belief, direct mail has been enhanced by online marketing. Direct mail is phenomenal at persuading people to visit your company webpage, urging them to purchase online all the while gathering data including email addresses and traffic information from visiting prospects. Adding a scratch-off to a mailer is an ideal way to motivate customers to interact with your mailers. Scratch-offs create enthusiasm and intrigue which help make your piece and ultimately your brand more valuable. Scratch off cards are an unbelievably powerful approach to lift company morale and culture. Offering paid time off, cash rewards and other corporate perks is a simple approach to demonstrate you value and respect your employees. Scratch offs for fundraising is one of the most financially beneficial methods available to any organization needing to raise money. Your organization can acquire a number of cheap or even free prizes to include on the tickets. By selling the tickets, you can cover the costs of the prizes and printing, leaving the remainder as margin for the fundraiser. Gift cards can be produced in a number of ways from cardstock to plastics. Many popular standard amount gift cards have a security area that covers the barcode or other sensitive information. Think iTunes and Starbucks gift cards, or even prepaid Credit Cards. This ensures the cards will remain effective and have a longer shelf life. The options are limitless though and you may find another use for the scratch off area on your gift cards. Some establishments offer scratch offs during the checkout process. Some require you to come back to the establishment to scratch off the prize area. Others are more realistic and have a number of different offers from a percentage off their next purchase to free with purchase or BOGO options as the prize. 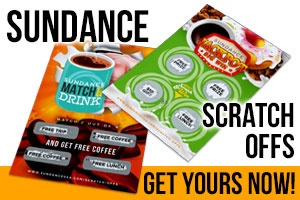 SunDance has created a sample Scratch-Off Card set to show you the possibilities. Request your sample today to get an idea of all the things you can use a scratch off for in your promotions.